Nissan is the world's sixth-largest carmaker and its site in Sunderland is the UK's biggest car plant. "I feel despair, indignation and resentment." said Nissan chief executive Hiroto Saikawa at a news conference. "As the details are disclosed I believe that people will feel the same way as I feel today," he added. 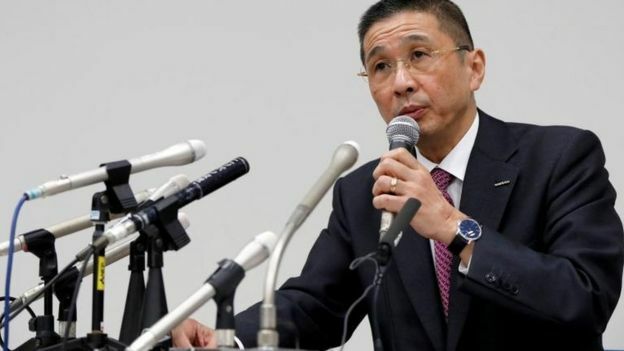 Nissan's Hiroto Saikawa said he believed the misconduct "went on for a long period"
Mr Saikawa said Nissan would now try to "stabilise the situation, and normalise day-to-day operations" for staff and business partners. Mr Kelly - who has also been arrested, according to the firm - was described as a close aide to Mr Ghosn. Mr Saikawa said he was able to "exert influence" in the company. In addition, he is chairman and chief executive of the Renault-Nissan-Mitsubishi Motors strategic alliance. Shares in Renault fell sharply after the news, dropping almost 10%. Mr Saikawa said that Mr Ghosn had been given too much power making proper oversight difficult. "The problem of governance was significant. Looking back, after 2005 when he became CEO [chief executive] of both Renault and Nissan, we did not really discuss the implications," he said. "As a shareholder... however, the French government will remain extremely vigilant regarding the stability of the alliance, the (Renault) group and... its employees, who have the full support of the state." 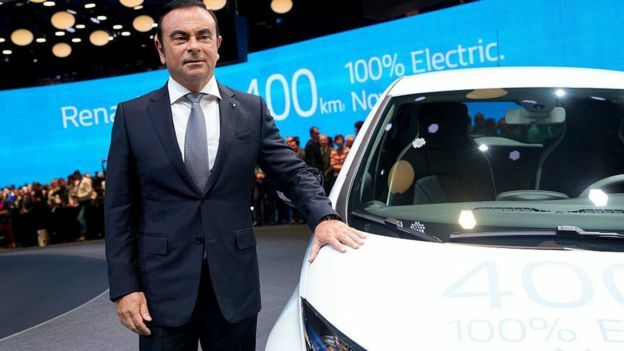 The scandal comes just months after Mr Ghosn's €7.4m pay package from Renault for last year was narrowly approved by shareholders.